Categories: N.A.S., QNAP, Expansion Unit NAS. Tag: QNAP-REXP-1220U-RP. The REXP-1220U-RP expansion enclosure is designed for expanding the storage space on a QNAP NAS* by connecting multiple expansion enclosures via high-speed mini SAS cables. Featuring a 12 Gbps SAS interface on the chassis, the REXP-1220U-RP ensures fast data passthrough from 12 Gbps SAS-enabled QNAP NAS even when using 6Gbps hard drives. This is especially useful for large data applications that require high performance interconnection, such as video surveillance, archiving large data, and TV broadcast storage. *The maximum capacity is calculated by using 8 TB 3.5″ HDDs & 1 TB 2.5″ HDDs. ** Purchasing a SAS expansion card is required for connecting over 4 units of RAID expansion enclosures. Simply connect a REXP-1220U-RP to a QNAP NAS* and power it on. The QNAP NAS will detect the hard drives in the REXP-1220U-RP as newly-installed local drives. You can seamlessly expand and manage the NAS capacity by using the powerful QTS Storage Manager. 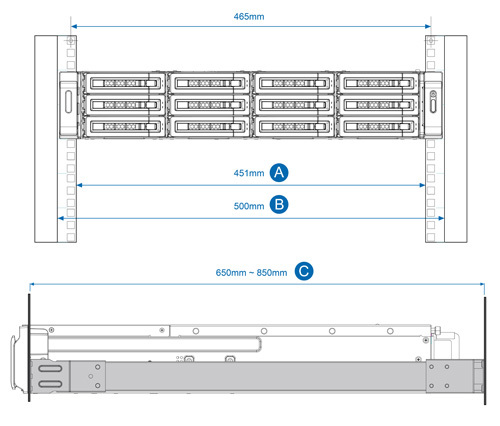 The REXP-1220U-RP supports 12 hard drives and 96TB raw capacity in 2U rack space. The REXP-1220U-RP has three SAS wide ports for host connectivity and daisy-chaining respectively. Each SAS wide port combines four SAS channels (maximum 8 SAS channels supported per expansion enclosure), with each supporting 12Gbps full duplex speed. The solution delivers unprecedented performance of up to 48Gbps per host connection. The QTS Storage Manager neatly presents tools and options for managing system storage with an intuitive graphical user interface, which simplifies the process of NAS capacity expansion and REXP-1220U-RP management. IT administrators can easily monitor the health of the REXP-1220U-RP and the disks within it. When cascading multiple expansion enclosures in a rack, the Locate Disk and Locate Enclosure functions assist IT administrators in quick maintenance. In addition to expanding an existing volume, IT administrators can use the REXP-1220U-RP as a budget-friendly external storage to perform speedy and secure backup tasks for a QNAP NAS. The QNAP RTRR (Real-Time Remote Replication) or rsync service lets IT administrators back up NAS data to the REXP-1220U-RP on a real time or scheduled basis. The REXP-1220U-RP offers high flexibility in hard drive selection. IT administrators can choose enterprise-level SAS HDDs with high performance and high reliability for mission-critical applications, low-cost but high-capacity SATA HDDs for large data archiving, or high-speed and high-stability SSDs for I/O-intensive operations.